There are a billion fewer birds in North America than there were 40 years ago, and a fifth of the bird species on the continent are listed as “vulnerable” to population collapse over the next few decades. Save the seeds. Some tidy gardeners might snip the stems of perennial flowers in the fall. 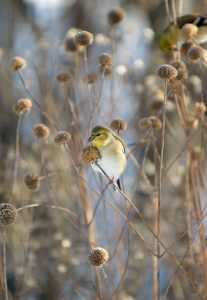 But the seed heads of coneflowers , Black-Eyed Susans , and other native wildflowers provide an excellent source of winter calories for birds. “They’re almost invisible, those seeds, but birds eat them all winter long,” Winston says. Native grasses—like bluestems or gramas —also make for good foraging after they go to seed. Letting dead plants stick around can fill your property with protein-packed bird snacks in the form of insect larvae, such as the fly and wasp larvae that inhabit goldenrod galls. Leave the leaves. Put down the rake! “Those leaves are important because they rot and enrich the soil, and also provide places for bugs and birds to forage for food,” Winston says. Leaf litter isn’t just free fertilizer—it’s also a pretty happening patch of habitat for a variety of critters such as salamanders, snails, worms, and toads. “If you’re digging in the garden and come upon these squirmy little coppery-brown dudes, and you don’t know what they are—those are moth pupae,” Winston says. A healthy layer of undisturbed soil and leaf litter also means more butterflies and moths, which in their caterpillar phase are a crucial food source for birds. Build a brush pile. Blustery fall days also tend to knock down tree branches. Use them to build a brush pile that will shelter birds from bad weather and predators. American tree sparrows, black-capped chickadees, and other winter birds will appreciate the protection from the elements. Rabbits, snakes, and other wildlife also will take refuge there. Skip the chemicals. You might see your neighbors spreading “weed and feed” mixtures in the fall to fertilize their lawns and keep crabgrass at bay. Chemical fertilizers encourage non-native plants to grow, making the space uninhabitable for birds. Native grasses, shrubs, trees, and flowering plants don’t need chemical fertilizers. Grass clippings and mulched leaf litter provide plenty of plant nutrition. Hit the nursery. 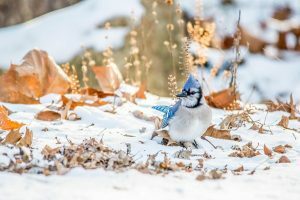 Although laziness is the rule of thumb when it comes to creating a bird-friendly backyard, it’s worth the one-time investment to plant native shrubs and trees that won’t need much tending in the future. Native dogwoods, hawthorns, sumacs, and other flowering shrubs produce small fruits that not only feed birds during the colder months, but can also provide a welcome pop of color when winter gets drab. Planted in the right place, evergreens like cedars and firs give birds something to eat and a cozy shelter. Fall is also a great time to liven up your property with late-blooming perennials such as asters or sages. To find species suited to your yard, just enter your ZIP code in Audubon’s native plants database. I recently resurfaced a gravel driveway/parking lot and noted a huge increase in birds prsaent pecking on the small stones. We have a half dozen bird feeders, and lots of visitors (birds, squirrels & chipmunks) in our back yard. Winter arrived before I could get Fall cleanup projects underway, but will limit the extent of my cleanup down the road. And all that leaf litter and brush piles are the PERFECT home for TICKS, which are now ACTIVE year round. Ticks pass a multitude of infections. Usually 3 or more at a time. One bite gives all that the tick is carrying. Which, btw, are being spread by white footed mice and BIRDS. Most people will never see the tick that bites them, and only 40% will get a rash that helps to identify Lyme Disease. Testing for Lyme is no better than a coin flip, and only a Lyme Specialist knows to test for the co-infections, or how to properly treat them all. Lyme Disease will destroy your life. It’s not an easy to treat, no big deal infection. It is a very SERIOUS DISEASE that can lead to paralysis, seizures, cancer, death. Thanks for the breath of fresh air. I bet you’re the star at every dinner party. Opossums are magnets for ticks and eat them by the hundreds. Ticks are candy to them. Are you somewhere where you can attract opossums? The birds and other animals will also eat the ticks. The fear and anxiety over a CDC created experiment gone haywire likely kills even more people than the ticks actually do. , blackflies, mooseflies and horseflies. When I find the occasional tick on me, it goes to the ‘Tick Resort’, a small plastic cup with a lid and alcohol in it. I say the words, “Welcome to the pool!” And drop em in with its already dead cousins for a posthumous reunion. I also take a homeopathic remedy for tick bites if I find a rare one that has chosen to incorrectly dine on me. Ledum Palister is derived from azaleas. I pop a few 3x a day for a week if bitten by a tick. Please dont let fear keep you inside and ruin your ability to engage with delight in our beautiful world. It depends on where you live and what sort of climate you live in. There are lots of areas in eastern Ontario that aren’t prone to ticks at all, and many areas that do have ticks, but not ones known to carry Lyme. Besides, ticks can’t bite through clothing, and I don’t know anyone walking around in fall and winter without long pants or at least socks on. You are exponentially more likely to get a tick bite in spring and summer, when you walk around in flip flops and shorts. I should know, I work at a summer camp that has long grass and active ticks. We’ve never had any cases of Lyme disease, but the best way to reduce your chances are to just cover up any skin you plan on having exposed walking in long grass. Encourage opossums, which are voracious tick-eaters. So I live on Long Island, what month should I do my cleanup in the spring? Excellent! We live on a farm (presently fallow, a 200+-year old orchard inherited from my great uncle) that we have strived to create an all-critter sanctuary. Sadly, we’re ageing out and moving sooner or later, probably sooner… We’re moving to a new,tiny mobile home on Cape Cod– abutting the south Wellfleet Audoban sanctuary! Birds r’ us!! Thanks for your terrific advise. Bird feeders are an additional good thing. Good for both birds and people looking at them. i had no idea how important it is to leave the leafs. I read just the opposite in a garden article. Great article ! Thank you for thinking about birds during the winter months and educating people on the importance of helping them survive. These easy steps can really help our bird population. So impressed and will defintely follow all of it.Thank you very much for writing up this little guide book. Thanks for this information. I haven’t raked my backyard leaves as yet – now I won’t. Great article! I plan on making my yard more bird friendly this winter. Another reason to not cut back some perennials is that ladybugs overwinter in the hollow stems. And we need our lady bugs! Love It! We all need to protect and help animals. Wonderful article with invaluable information. I recently moved from a stark piece of rented property to a magical forest! My tiny house is sheltered by big-leaf maples, firs, and vegetation native to this area of the Pacific Northwest. It’s true, folks. It goes against every fiber of my body to leave the masses of maple leaves just where they are. But, once I saw all the bird, salamander, and slug activity, I knew I couldn’t disturb their environment. Besides, I’ll have wonderful compost this Spring! Now I won’t feel bad that I didn’t clean up. Indeed, my yard is full of birds all day long. Hopefully, less insects in spring. Great article! We began rewilding our backyard this past summer — adding fallen tree logs, allowing our grass to grow, clearing out invasive honeysuckle, etc. — and immediately noticed much more wildlife.